Today (Sunday) is the last day of Geek Weekend. We’re excited to see what we’ll achieve! The following feeds have been added or updated. To get the updated database go to Settings->Database and check for updates. 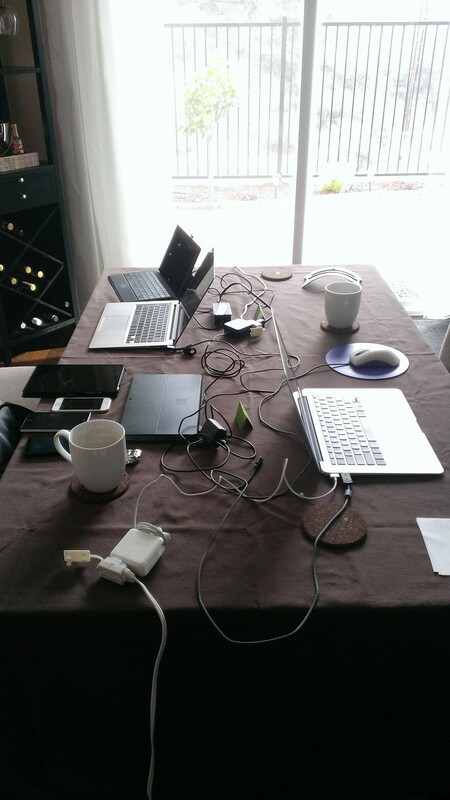 7 Phones, 2 Ultrabooks, 3 Tablets, 2 Coffee Cups and 1 Very Understanding Wife! That’s the formula for what is shaping up to be a very successful geek weekend! So, what have we been up to so far? James arrived on Thursday night, so we caught up for an hour or so before getting a good night’s sleep in. On Friday, after getting set up, we started with a discussion of what we wanted to achieve, both long term and this weekend. Typically we both work independently, so we had a few things to demo to each other of some new core components that will form part of BringCast v4.0.0. Around lunch time, we hooked up with Mr Travis Lowdermilk (of Windows Developer Show fame!!) for a video chat and general UX geek out about our various pain points with BringCast’s current UX. This picture shows Travis drawing on his whiteboard via video chat! It was an awesome session and certainly gave James and me lots to think about with regard to our planned UX overhaul for v4. After a well-earned lunch break in the San Diego sunshine, James and I got back to coding for a few more hours. This coming weekend, James and I will be getting together for a weekend of pure geekery! Since we live about 1,300 miles apart (James in Redmond, WA and me in San Diego, CA), we try to get together a couple of times a year for a pure geek-out. 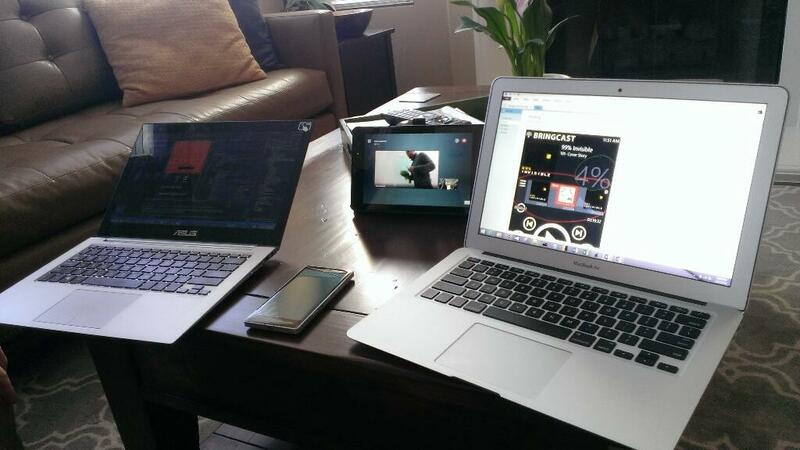 We refer to these as “Geek Weekends”! We’re hoping this coming weekend will be equally as productive!! James arrives in San Diego late on Thursday night. Armed with coffee and food supplies we’ll be squeezing as much BringCast goodness as we can into Friday, Saturday and Sunday! Follow what we’re up to via Twitter, Facebook and of course this blog! We plan to use the hashtag #GW14 on Twitter, so keep in touch! We’ve been busy adding your podcast requests to the database. While you can easily update this over-the-air via Settings > Database > Check for Database Update, we like to always ship the latest version with each update. See earlier blog posts for details of all the new podcasts that have been added here and here. The “wp-podcast” protocol is a project spearheaded by our friend Rob Irving, author of the great app, Car Dash. Rob proposed the idea of having a standard “podcast protocol” to enable apps on the phone to easily interact with whatever podcasting app a user might have installed. This makes life easier for developers, as they can make their app work with a single podcast protocol, and have the confidence that other apps that implement it will integrate also. Rob worked with us and also Mark Monster of P|Cast to flesh out and stabilize the protocol, and now Car Dash, P|Cast and of course BringCast have all been updated to use it. The end result is more seamless integration between the apps! Rob has detailed the protocol on his blog, here. 3.8.2 also squashes a lot of bugs. We tackled the topmost bug occurrences to give everybody a more reliable experience. The keen-eyed amongst you may notice we dropped the animated transitions between the pages. This fixes a weird graphical glitch that Steve Litchfield at AAWP was seeing on his particular combination of a Lumia 1020 with the Black update installed. We’re glad to have that one squashed, and we quite like the lack of transitions – it seems to make everything that bit faster! Go get BringCast 3.8.2 now from the store. BringCast 3.0.4 for our WP7 will be coming soon, too! We pushed out an update to our beloved Windows Phone 7 users over the weekend. Version 3.0.4 addresses the top bugs and shows our commitment to our users on the older version of the OS. Unfortunately, when pushing this update out, we inadvertently managed to vaporize the Windows Phone 8 application package, containing BringCast 3.8.1!! This manifested itself on user’s devices by the Store offering to “upgrade” our WP8 users to the WP7 version of the app!! Not something we planned, or that you guys wanted, we’re sure…! So – please accept our apologies. This was a mistake and we’re working fast to fix it. BringCast 3.8.2 for WP8 is currently pending approval, and as soon as it is available, it will fix those users who got downgraded. We can confirm that subscriptions and settings will be restored when 3.8.2 is installed! If you’re still running BringCast 3.8.1, please do not update from the store until we give the all clear. Sorry again for this mistake! Hopefully everyone will be up and running again in the next day or two. ObjectivePixel Blog Create a free website or blog at WordPress.com.